Sonos announced its deals for Black Friday 2018 last week, and we have good news and bad news if you missed it. The good news is that the company is offering sweet discounts on the Sonos Beam, Sonos One, and Sonos SUB speakers. The bad news is that the company isn’t offering discounts on any other speakers. If you’re looking for discounts on two of Sonos’ best-selling speakers ever — the Playbar sound bar and Play:1 — you won’t find anything on the Sonos website. As it turns out, however, Amazon already has early Black Friday deals live right now on both of these great speakers. The Playbar sound bar sells for $699 on its own on the Sonos website and from all of Sonos’ retail partners. 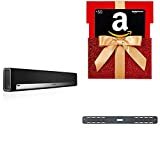 But for the same $699 on Amazon, you can now get the Sonos Playbar TV Soundbar with Sonos Wall Mount Kit + $50 Amazon Gift Card. That effectively drops the price to $649, plus you get a free OEM wall mount! If you’re looking for a deal on the Play:1, you can snag a Two Room Set with Sonos Play:1 + $30 Amazon Gift Card for $298, the same amount you would pay for two Play:1 speakers from Sonos. That makes the price just $268, or $81 less than you’ll pay for one Apple HomePod.